Seeking to find the best Bluetooth lock to complement your smart home can be tricky. There are several factors that have to be taken into consideration when you want to make even the smallest addition to your smart home. The reason behind this is the simple fact that smart homes are only as strong and accessible as their weakest link. Smart homes are the hybrids of traditional methods and the more technologically influenced ways of doing things. For instance, comparing smart locks and traditional locks will show you that smart locks build upon traditional locks. As such, a lot of care has to be put into making sure that each of the elements you introduce into the smart home is compatible with one another. This is where Bluetooth locks come into play. Many homeowners gravitate towards Bluetooth door locks when it comes time to upgrade to a door lock that complements your smart home. The thing is, how do you qualify the best Bluetooth lock and how do you single out the lock that will be best at pairing with your other smart devices? If you are not too savvy when it comes to technology, I will forgive you for thinking that Bluetooth technology is exclusive to headphones and smartphones. However, Bluetooth technology has far wider implications and influences than that. Essentially, Bluetooth is a wireless communication protocol that makes use of radio frequencies to communicate with other designated wireless devices. Wireless communication protocols are an essential feature to look for in smart locks. 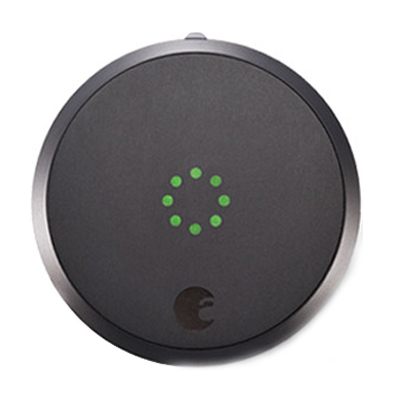 There are several other wireless communication protocols that homeowners have to choose from if they want a smart lock that merely allows for wireless control. For example, Z-Wave and Zigbee are also seemingly popular wireless protocols that work with some smart locks. However, Bluetooth did not become so popular within residential settings simply because it has a cool name and logo. The best Bluetooth lock is probably more popular than the best Wi-Fi enabled lock or Z-Wave enabled lock because of its features. Due to its method of communication, Bluetooth locks are able to operate in states of low power consumption and communicate with devices in distances of up to approximately 60 feet away. This means that most homeowners will keep their security measures intact and effective even in the event of a power outage. What complements your smart home? Good question! As I pointed out earlier on, you have to pay close attention to the way your devices complement one another within the smart home. If they are not able to effectively communicate with one another, there is an increased possibility that your devices can be compromised and made vulnerable. So here are some of the things you have to look for in a Bluetooth lock. Ideally, you want a Bluetooth smart lock that consumes low amounts of power without sacrificing the way in which it connects to your smartphone. Also, you should look for a lock that integrates well with other home automation devices. However, you should keep in mind that not every Bluetooth smart lock is going to meet all of these requirements unless of course, it is the absolute best Bluetooth lock. Here are the 5 best Bluetooth locks that are guaranteed to complement your smart home. 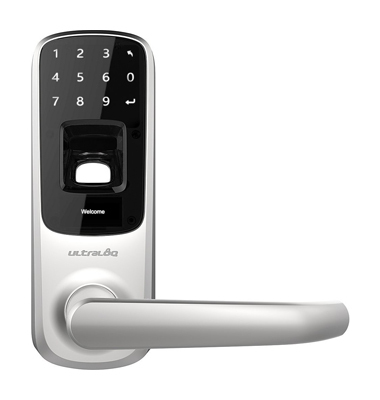 The UL3 BT smart lock from Ultraloq is the Bluetooth enabled version of their already popular fingerprint UL3 door lock. This model keeps all the positive traits of the original fingerprint model and pairs the lock with Bluetooth Low Energy (BLE) capabilities. Doing so puts the primary power to control your lock in the palm of your hands and it makes your smartphone the key to your smart home. This is accomplished through the combination of BLE 4.0 connectivity and the Ultraloq app that serves as a bridge through which you can control the lock. This smart lock is a good addition to any smart home, but it does have its caveats. Although it holds up fairly well in terms of security, it does not do well when you focus on device integration. Now, keep in mind that aside from connectivity, security and integration are two important factors that are used to classify some of the best Bluetooth locks for smart homes. Let’s take a quick look at how it fares on either of these fronts. In terms of security, the lock does its best to do away with a traditional keyway and instead offers homeowners the ability to open control the lock with a smartphone via Bluetooth, or to utilize a fingerprint reader or a touchpad. The absence of a traditional keyway removes that danger of lock bumping and lock picking. The presence of features like the anti-peep touchscreen and the advanced fingerprint identification system make the lock a pretty solid security addition. However, what do these security additions mean for integration? The lock currently has no integration capabilities, and by that I mean none. It is not currently compatible with Z-Wave or Zigbee protocols, neither is it with Wi-Fi. Each of these protocols is a way to communicate with other smart devices. This does not greatly detract from the traditional function of the lock, but it does make it less of a complementary feature to some smart homes. It was mostly due to its security features and the presence of BLE that I saw it fit to include on this list. As with most new smart locks, I believe that there are many changes on the horizon for the UL3 BT, and I do believe that integration is one of those many changes. 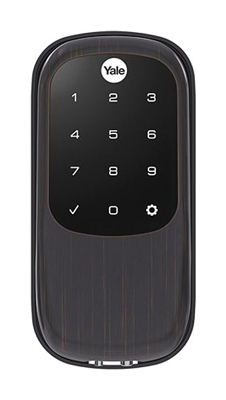 Multiple secure access points such as the Fingerprint reader, Smartphone control and connectivity, and the use of a secure keypad. Absence of traditional keyway helps keep the lock more secure. 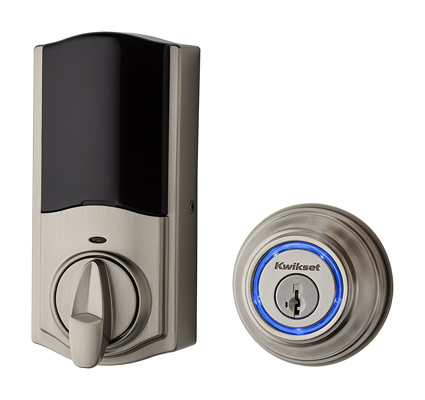 Another top contender for the best Bluetooth lock is the second generation Kwikset Kevo Smart Lock, which you will probably recognize from the August vs. Kevo blog post. The first generation Kwikset Kevo is notorious for the number of security bypasses that were used against it. However, this lock should not be dismissed because many of its security flaws were improved upon with the new generation of the lock. Before we dive into that, let’s take a look at the ways in which this best Bluetooth lock complements your smart home. The second generation Kevo Kwikset employs the use of Bluetooth Low Energy (BLE), which is best suited for locks that want to use proximity settings without having to skim on the available power supply. Proximity settings give users the ability to have their lock open or close automatically by judging your proximity to the lock. The Kevo is able to accomplish this by communicating over BLE with your smartphone, which helps the lock approximate your location. The Kwikset makes use of BLE and couples it with military grade PKI encryption, which beefs up the security that the lock is afforded. The presence of a traditional keyway is still an inherent vulnerability, but not one that disqualifies the Kevo from consideration as one of the best Bluetooth locks. The lock boasts the presence of advanced smart key technology, which is supposed to provide additional security against forced entry methods like lock picking or lock bumping. There are few smart locks that boast the level of compatibility of the Kwikset Kevo. In fact, this is probably their most prevalent feature of the Kwikset Kevo, the fact that it opens up your smart home and makes it more accessible. This lock is able to pair with easy to set up security cameras as well as smart doorbells and other home automation products that truly make your home come alive. Capable of integrating with multiple smart devices, which effectively increases the number of actions that your lock is able to control and execute. Uses BLE to connect with your smartphone, which allows it to lock or unlock automatically based on its proximity settings. Military grade PKI encryption minimises the ways its cybersecurity can be compromised. The Schlage Sense Bluetooth touchscreen deadbolt is a rather popular lock. If you are one of our more dedicated readers, you will probably notice that it is prominently featured on several of our lock related lists. The reason behind this is simple, if you haven’t already figured it out. The Schlage sense Bluetooth lock is a great lock. Now, it is probably not the world’s most secure lock, but it has a lot of dependable and sturdy features that help it land a spot on all manner of lists. For instance, this same lock is capable of being paired with a Wi-Fi bridge that will also technically make it non-traditional Wi-Fi deadbolt. However, the focus today is on the locks Bluetooth features and the ways the lock complements your smart home. Schlage’s smart lock is quite adept at working with other devices, although it seems to particularly favor Apple devices and the Apple Home Kit. 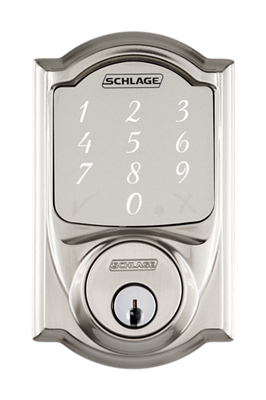 However, even though its scope of integration is seemingly limited, the Schlage sense proves to be a rather ambitious lock. Some of its additional capabilities include voice control options. The presence of voice control features elevates the ease of access that owners have to their locks, and therefore, their other smart devices. When this Bluetooth lock is paired with the Apple Home Kit, it gives homeowners more ways to interact with each of their smart devices. This, in turn, allows your lock to perfectly complement your smart home. Looking at products like the Amazon Echo and the Google Home will show you the ways in which Voice controlled commands have a solid impact on your smart home. The lock is paired best with the Apple Home Kit. Although this is somewhat limiting in terms of controlling devices, it is still a good gateway to further device connectivity. Voice control features (when paired with the Apple Home Kit) enhance the ease of access that homeowners can afford, and this complements other devices. Yale Real Living has a wide selection of smart locks that homeowners can choose from when they are looking to purchase smart locks that will complement their home. Some of these products range from Z-Wave compatible locks to Zigbee locks. However, in my honest opinion, their Bluetooth locks are better suited to complement your smart home. More specifically, the Yale Real Living Assure Lock (YRD446) is one of the best Bluetooth locks that available today, and it is primarily geared towards better connectivity and compatibility within the smart home. This contender for best Bluetooth lock is battery powered and requires 4 AA batteries to run. Luckily enough, the fact that is paired with a Bluetooth connection module ensures that it does not consume excessive amounts of power when it is in use. The fact that the lock supports Bluetooth connectivity means that it is able to communicate wirelessly with users, which enhances the ways in which users can access their lock. It allows for remote and automatic unlocking when the primary smartphone is within the designated radius. The Assure Lock also plays extremely well with other smart devices and easily integrates with all manner of home automation systems and monitored alarm systems. This integration is a key complementary feature. Essentially, this Bluetooth lock would not be considered as one of the best Bluetooth locks if it was not capable of integrating with other smart devices. However, it is always important to make sure you do not get wrapped up in the aspects of connectivity and leave out the importance of security. The primary function of any lock, Bluetooth or not, is to ensure that things are kept secure. As far as the best Bluetooth lock goes, the Assure lock is one of the more security forward facing ones on the market. This lock does away with the keyway, which is one major vulnerability that most locks have to contend with. There is no plausible way to attack the keyway of this lock because one does not exist, not even a backup keyway for burglars to attack. In the event that your lock loses power, you will be able to jump start your lock by using a 9V battery that grants you temporary access. Assure Lock utilizes BLE, which allows for low power consumption and increases the productivity and performance of your lock. This lock can integrate fully with other smart devices which increases the internal network of your smart home. The absence of a keyway also increases the security of the lock itself. Furthermore, there is no backup keyway to be taken advantage of either. BLE connectivity allows the lock to utilise hands free auto unlock and locking features. Seeing the August smart lock pop up on this list again should come as no surprise to those of you who are familiar with smart locks and Bluetooth locks. The August smart lock is one of the most easily identifiable Bluetooth locks on the market, and it is very well the poster child for Bluetooth locks that help complement the smart home. Now, I know that some people have their respective qualms with the August smart lock, but that does not detract from the fact that it is one of the only smart locks that promotes easy integration with other smart devices across multiple platforms. If that is not the perfect complementary piece to a smart home, then I am not sure what is. If you think I’m mistaken, let’s do a quick rundown and comparison of the ways this smart lock holds up against some of the other ones discussed above. Most of the locks listed above are easily integrated with three or four other devices, but the August smart lock is capable of integrating with Amazon Alexa, Nest products, IFTTT (If This Then That) protocols, Apple Homekit, and a host of other device protocols. The August Smart Lock, with the aid of BLE, allows homeowners the ease of access and comfort that most people want from their smart devices. Essentially, this lock is able to execute some basic actions, without even being told to do so. With the proper Bluetooth settings enabled, your August smart lock is able to approximate your location and open your door as you are walking up to your home. If the lock is paired with a security camera or a monitored alarm system, you have the luxury of knowing that your devices will be armed as soon as the lock is engaged. This is the type of connectivity that many homeowners are looking for in their Bluetooth smart locks. Unparalleled device connectivity that grants homeowners the ability to inter-operate their smart devices. The presence of BLE lets users control their lock remotely and hands free with the auto lock and auto unlock features. The August smart lock allows users to keep their existing hardware, which is its own draw for adding it to your smart home. Not much has to be changed in order to have your August smart lock up and running. The best Bluetooth lock might not be the most secure or the most robust in terms of security. However, it is a lock that allows users to make the most out of their Bluetooth capabilities, and also to enhance the connectivity that they have at their fingertips. I hope that this article has informed you on some of the basic features of the best Bluetooth locks, and the ways they complement smart homes. Hopefully, it serves as a guide for those homeowners who want to make the most out of Bluetooth locks.